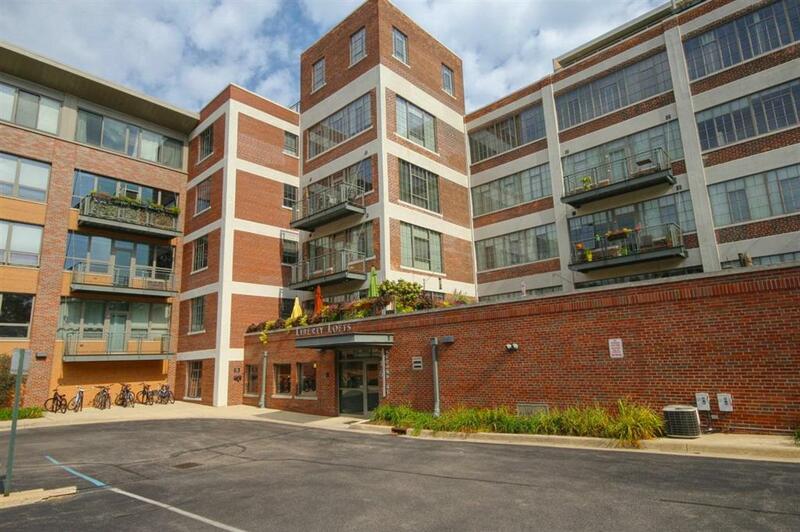 Stunning Liberty Loft Condo for Sale! Tucked away and very private, this second floor Cambridge model feels at once expansive and serene. At 1369 square feet, this unit is spacious with two generous sized bedrooms and two full baths. The living room and master bedroom each have walls of floor to ceiling windows looking out to an urban view of steel girding and sky. The view perfectly compliments the industrial finishes found throughout the loft with its exposed duct work, brick knee walls and concrete columns. There is a fireplace in the living room and beautiful granite counters and maple cabinets in the adjoining kitchen. The master bedroom suite includes a large walk through closet and double sinks in the master bath. The bedroom's interior wall was extended to the ceiling ensuring complete privacy. Two deed parking spaces, one in the heated garage and one in the surface lot are included with this condo.